Preferred Habitat: Rural areas near streams and ponds. Seasonal Occurrence: Common late-November through March. Scarce in summer. Breeds in our area. Profile by Glenn Olsen: It’s the month of December, most deciduous trees have lost their leaves, and the landscape is a soothing mix of grays and browns punctuated with bits of greens and yellow. I am standing at the edge of Elm Lake in Brazos Bend State Park looking for ducks and other marsh birds when the brilliance of a small, fire engine red bird rocketing into the air grabs my attention! 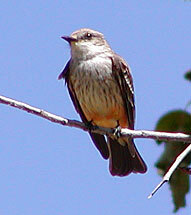 The Vermilion Flycatcher returns to the top of the dead brush from which it burst into the air to grab an unwary insect. This is the bird that I came to see and enjoy. The adult male is unlikely to be misidentified with its brilliant red-orange crown and body, blackish wings, and dark eye stripe. Adult females and young males typically have salmon to pinkish under tail coverts, with pale gray upper parts, and off white beneath with varying degrees of faint streaking. 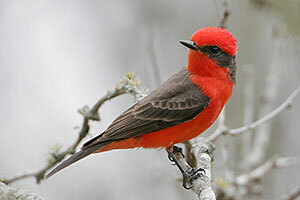 The Vermilion Flycatcher breeds in riparian corridors and open oak woodlands of the arid regions of south and central Texas, New Mexico, and Arizona. The population density in the breeding range varies from rare to uncommon and localized. 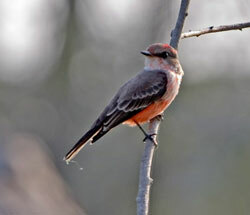 The Vermilion Flycatcher graces our area with its presence during our cooler months, typically November through March, as it moves south and east of the breeding range to spend the winter months. We usually will have a few of these birds spread around the various counties of our area in the winter. They are most easily located near small to medium sized ditches, ponds, and lakes. Here, they generally perch on small dead sticks low over the water, in the tops of dead trees, on limbs over hanging the water, or even on nearby fences. Christmas Bird Counts occur during the time these beautiful birds are in our area and are an excellent opportunity to get outdoors and enjoy this stunningly beautiful flycatcher.